The coastline surrounding Fowey has long been the inspiration for artists and writers, with fabulous scenery throughout the seasons. Why not put your walking boots on this month and set out on one of our favourite walks to blow away the cobwebs with some fresh air! The Hall Walk is a 4 mile circular walk from Fowey taking in the villages of Bodinnick and Polruan, which lie just across the estuary. The walk takes a couple of hours and is suitable for most walkers, although the paths can be uneven and there are a couple of short, steep climbs – well worth it for the views. From the boutique Old Quay House Hotel, turn right along Fore Street until you reach the car park at Caffa Mill and the ferry to Bodinnick. This tiny Cornish village is best known for its historic inn, The Old Ferry with terrace overlooking the estuary and Ferryside, the former home of author Daphne Du Maurier. Follow the steep lane past the Old Ferry and on the right a narrow footpath is sign posted ‘The Hall Walk’. The Hall Walk itself is actually the name for the footpath from Bodinnick to Penleath Point which dates back to the 16th century and was created by the Mohun family of nearby Hall. Follow the footpath on to the Q Memorial, situated above Penleath Point, for some fantastic views. The memorial is a monument to the novelist and scholar Sir Arthur Quiller-Couch, who lived in Fowey from 1891 until his death in 1944. The acclaimed restaurant at The Old Quay House, the award-winning luxury hotel in Cornwall, is also named ‘Q’ after Quiller-Couch. From the memorial, the footpath runs along the northern bank of Pont Pil, through fields and woodland where it is possible to find wild garlic and other hedgerow treats at certain times of the year. The footpath descends steeply, almost doubling back on itself to reach the pretty hamlet of Pont, which was once a thriving quay where barges carrying coal and limestone would unload. After crossing the bridge at Pont, take the path up to the right and look for a sign for Polruan. Continue uphill through more fields before passing a gate into woodland – take the lower path here and continue along it all the way to Polruan. There are benches at regular intervals on this section of the walk and the views out over Fowey and the estuary are fantastic, it’s well worth taking a short break here to take it all in. 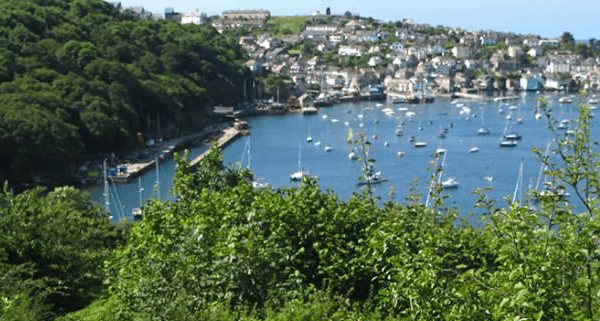 Polruan has a couple of friendly pubs including The Lugger, where walkers can enjoy a well-earned pint before heading back across to Fowey on the pedestrian ferry.